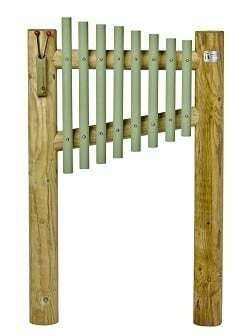 Soothing musical and colourful chimes bringing music to any garden. 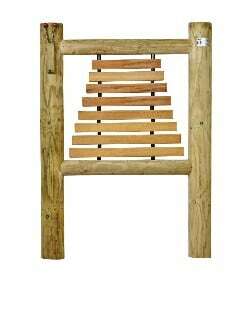 A set of eight multicoloured chimes mounted on a robust free-standing timber frame. Supplied with two beaters. Our entire range of treated timber frame products use Postsaver, which helps to prolong the life of the timber post and protects it from rot and damage caused by grass cutting. This item is available also available for In-Ground Installation (simply self-assembly required) or wall mounted – please enquire for prices. 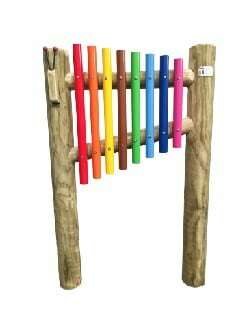 Constructed from durable natural materials this musical play element, with it's 8 bar melody allows the children to create different tones, developing physical coordination as well as creating noise. Our entire range of treated timber frame products use Postsaver; the Postsaver sleeve helps to prolong the life of the timber post and protects it from rot and damage caused by grass cutting.